Carrying only high-end labels, Shehnaai Couture has long been known as the go-to place for India’s Couture Collections in New York City. Now with an expanded showroom on Fifth Avenue in Manhattan’s Fashion District, Shehnaai’s collections of lehngas, saris, sherwanis and suits represent the biggest designers out of India. 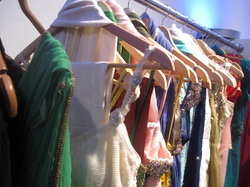 Shehnaai houses the latest collections from a hand-selected mix of established and upcoming designers. Labels such as Sabyasachi, Vikram Phadnis, Prriya & Chintan, Amber & Shirrin, Private Collections by Zeenat Sayani and Neeta Bhargava mix with newcomers such as SaanShe, Zene by Priya and Farzeen and many others. Each of Shehnaai’s designers has established brand presence in India and each collection is indicative of the designer’s individuality. 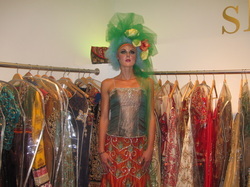 Multi-designers and seasonal rotation keeps the boutique completely on trend with the fashion of India. The fashion presentation included live mannequins dressed in elaborate headgear over glittering lehngas while a dancer/contortionist performed along side them. The sponsors for the night’s event include Moghul Caterers, The Cake Designer and DJ Kucha Company. The event was hosted by Bibi Magazine. With it's unique product line, personalized service and recurring designer trunk shows and seasonal fashion shows, Shehnaai Couture bridges the gap between New York City and India’s Runway Couture.